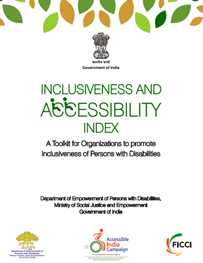 To complement and achieve the aims of “Accessible India Campaign” (Sugamya Bharat Abhiyan) an “Inclusiveness and Accessibility Index” has been developed by FICCI for the Department of Empowerment of Persons with Disabilities, Ministry of Social Justice & Empowerment, GoI. The aim of the Index is to Promote Inclusiveness and Accessibility for Persons with Disabilities at the work place. This index was launched on March 30, 2016 at Vigyan Bhavan, New Delhi. Shri M. Venkaiah Naidu, Hon’ble Minister of Urban Development, Housing & Urban Poverty Alleviation and Parliamentary Affairs, GoI launched the “ Inclusiveness and Accessibility Index” in the gracious presence of Shri Krishan Pal Gurjar, Hon’ble Minister of State for Social Justice and Empowerment, GoI and Shri Vijay Sampla, Hon’ble Minister of State for Social Justice and Empowerment, GoI.